The Halo Vault: When you see Moilanen arc - look below the sun! 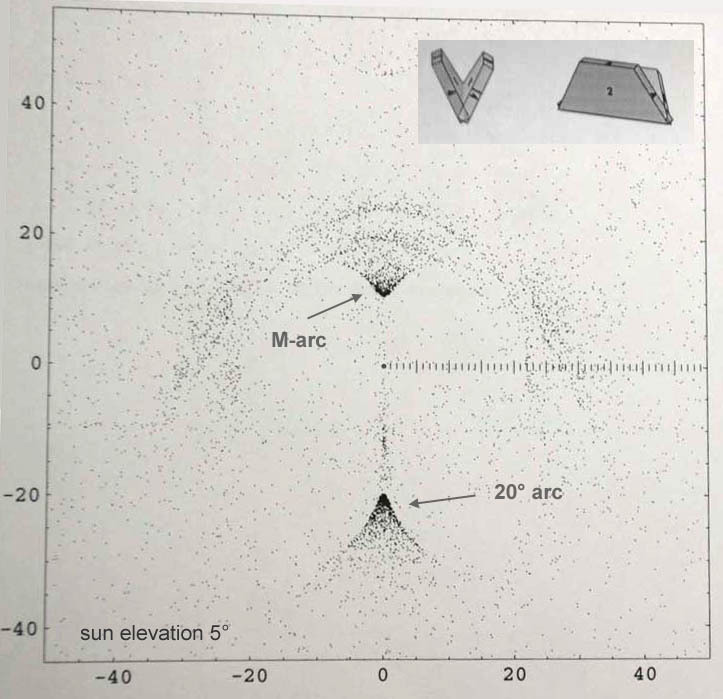 Several of us have been talking about a possible explanation for M-arcs. The responsible crystals are twinned trapezoidal plates that have what might be called restricted Lowitz orientations. The crystals perform rotational oscillations about a horizontal axis, with the equilibrium orientation having the vee opening directly upward, as in the left hand crystal. All of us are more or less skeptical about this explanation, but we think it deserves testing. The model predicts a strong lower 20° arc. We are asking that, if you are lucky enough to see an M-arc, then please put yourself in an elevated position and look for the lower 20° arc. There are other observing suggestions as well, but I think I will leave them for the blog. One shotcoming of this model may be that it produces an arc that stays all times at the same distance from the light source. Several photos indicate that Moilanen arc takes distance from light source the higher the light source gets. But measurable photos are rather scarce. We would need more of them and that's why sun or moon should be blocked with filter. Especially high light source (>20 degs) are of interest. For those who photograph crystals, any displays, also those that don't have Moilanen, are valuable. Especially samples from diamond dust where the Moila is first not present and then appears, should be interesting. This should allow us to at least narrow down the suspects, even if the very structure in the crystal that makes Moilanen arc decides to keep playing seek and hide. I can tweak the simulation to try to modify the shape and position of the arc, but it seems like a waste of effort unless somebody sees a lower 20deg arc and an M-arc together. Until that happens, I cannot get too excited about this model. Yeah I agree with so many observations of this arc it really is bugging me because I myself have yet to see one. Its in the teens right now in Southern Ohio but I have no clay and my halo gun is in my barn which cannot be opened because we have three kittens living in it that are being kept warm. I hope one of you folks will solve the mystery behind M-arc and for any who does should get the nobel prize.